Twinkle, twinkle, little star, how I wonder what you are! 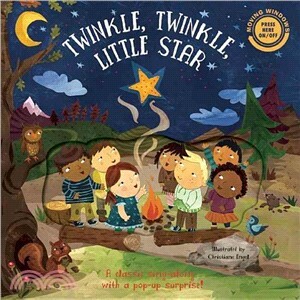 Join this merry group of children for a fun, nighttime camping adventure under the stars. With just the touch of a button, they can listen to childhood favorite Twinkle, Twinkle, Little Star while they participate in the story. Includes an amazing die-cut cover with a moving illustration, button-activated music, playful illustrations throughout, and a grand, full-spread pop-up finale. Grab a sleeping bag--this book is sure to become a bedtime favorite. Christiane is a freelance illustrator living in London. She has worked for a wide variety of international clients, ranging from high profile ad agencies to small businesses. She has illustrated school books, picture books, a kids' bible, an award-winning ad campaign for the COI and regularly provides editorial illustration for newspapers and magazines. Her first illustration job was a children's book that she also wrote, called Louis+Bobo. Clients have included; Chrysalis, Harcourt Education, Unicef, Barefoot books, The Guardian, Oxford University Press and many more.